Skyworks Global- A company that’s specialized in ‘gyroplanes’ for over twenty years-is producing a powerful VTOL business aircraft. With the Skyworks Global Heliplane ready to manufacture, and the HAWK-5 already in the air, the company is well set as a powerful player in the VTOL aircraft space. The Skyworks Global Verti-Jet is a business conversion of existing technology used in the company’s ‘Heliplane’. The Helipane (featured below) is currently being marketed towards the U.S Marines. According to Skyworks Global’s brochure for the Heliplane, the aircraft can reach speeds of up to 400mph and has a range of 1,000 miles. It flies a combination of slowed-rotor compound lift technology (similar to the Carter Copter), a fixed-wing for the lift in horizontal flight, and turbofan or turboprop engines for propulsion. Above: The Skyworks ‘Heliplane’ which is currently being marketed to the U.S Marines. Top speed is 400mph with a range of 1,000 miles. According to Skyworks Global, the company’s motivation for building gyroplanes comes from the fact that they are both versatile and economical, as well as “unconstrained by the physics imposed speed, range, and payload limitations of a helicopter”. The company has been working on gyroplanes for over twenty years, starting with the Hawk 4, which flew at the Salt-Lake City Olympics in 2002. Above: The Skyworks ‘Hawk 4’ which flew at the Salt Lake City Olympics in 2002. 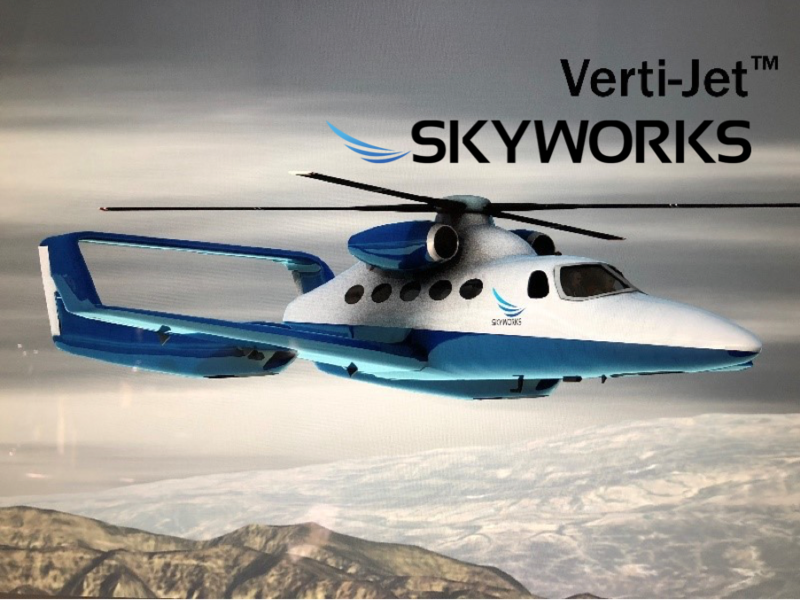 Why it’s important: While the Skyworks Verti-Jet is not an electric VTOL, it has a very strong use case for business travel between cities, much like the Transcend Air Vy 400 or the XTI Tri-Fan 600. With a depth of experience in gyroscope flight technology, and a potential air taxi in the ScoutHawk, the company is well positioned to provide vehicles for the urban air mobility space.